Researchers Dr Ismail, Dr Muhammad Murtadha and Baharin Abu Bakar from Universiti Teknologi MARA, Malaysia carried out a conceptual study on mathematical modelling for sea wave in electricity generation. This conceptual study focused on using Oscillating Wave Column (OWC) which is considered as the most efficient way to utilize sea waves, the largest power source on earth, to generate electricity. 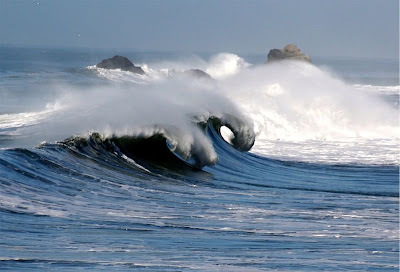 Previous studies have revealed that global wave power is estimated to be 1TW (1 terrawatt). Countries where numerous seafronts surround the country could tap into an alternative source of power generation which could be generated by the waves during the different seasons of the year. In addition, the findings of this study could be adapted to evaluate the capability to produce electricity on shore such as from lakes and rivers with undulated waves. Researchers began the study with the derivation of mathematical equations for each component in the electrical generation system after taking into consideration the sea wave as the input to facilitate the workability of the entire system. The team of researchers verified the validity of the developed mathematical equations for each stage of the research. This was done to establish its workability. Electrical and mechanical relationships were derived to relate the workability of each component in the system for the purpose of electricity generation. Numerous experiments were conducted to optimize the results in this study which would eventually lead to the generation of electricity. The results obtained from the experiments indicated that the proposed model appears practical could be implemented. Funded by; Research Managemant Institute, Universiti Teknologi MARA, Malaysia. Astronomers were puzzled earlier this year when NASA’s Hubble Space Telescope spotted an overabundance of dark matter in the heart of the merging galaxy cluster Abell 520. This observation was surprising because dark matter and galaxies should be anchored together, even during a collision between galaxy clusters. Now, a new observation of Abell 520 from another team of astronomers using a different Hubble camera finds that the core does not appear to be over-dense in dark matter after all. The study findings were published inThe Astrophysical Journal. Hubble observations announced earlier this year by astronomers using Hubble’s Wide Field Planetary Camera 2 suggested that a clump of dark matter was left behind during a clash between massive galaxies clusters in Abell 520, located 2.4 billion light-years away. The dark matter collected into a “dark core” that contained far fewer galaxies than would be expected if the dark and luminous matter were closely connected, which is generally found to be the case. Because dark matter is not visible, its presence and distribution is found indirectly through its gravitational effects. The gravity from both dark and luminous matter warps space, bending and distorting light from galaxies and clusters behind it like a giant magnifying glass. Astronomers can use this effect, called gravitational lensing, to infer the presence of dark matter in massive galaxy clusters. Both teams used this technique to map the dark matter in the merging cluster. Clowe’s team used Hubble’s Advanced Camera for Surveys (ACS) to measure the amount of dark matter in the cluster. ACS observed the cluster in three colors, allowing the astronomers to distinguish foreground and background galaxies from the galaxies in the cluster. From this observation, the team made an extremely accurate map of the cluster’s dark matter. “With the colors we got a more precise selection of galaxies,” Clowe said. The astronomers estimated the amount of dark matter in the cluster by measuring the amount of gravitational “shear” in the Hubble images. Shear is the warping and stretching of galaxies by the gravity of dark matter. More warping indicates the presence of more gravity than is inferred from the presence of luminous matter, therefore requiring the presence of dark matter to explain the observation. “The WFPC2 observation could have introduced anomalous shear and not a measure of the dark matter distribution,” Clowe explained. Using the new camera, Clowe’s team measured less shear in the cluster’s core than was previously found. In the study the ratio of dark matter to normal matter, in the form of stars and gas, is 2.5 to 1, which is what astronomers expected. The earlier WFPC2 observation, however, showed a 6-to-1 ratio of dark matter to normal matter, which challenged theories of how dark matter behaves. “This result also shows that as you improve Hubble’s capabilities with newer cameras, you can take a second look at an object,” Clowe said. His team is encouraging other scientists to study its data and conduct their own analysis on the cluster. Clowe’s co-authors on the paper are Maxim Markevitch of NASA Goddard Space Flight Center, Greenbelt, Md. ; Marusa Bradac of the University of California, Davis; Anthony H. Gonzalez and Sun Mi Chung of the University of Florida, Gainesville; Richard Massey of Durham University, Durham, England; and Dennis Zaritsky of the University of Arizona’s Steward Observatory, Tucson, Ariz. These composite images taken by two different teams using the Hubble Space Telescope show different results concerning the amount of dark matter in the core of the merging galaxy cluster Abell 520. In the top image observations of the cluster, taken by Douglas Clowe with the Advanced Camera for Surveys, mapped the amount of dark matter in Abell 520. It reveals an amount of dark matter astronomers expect based on the number of galaxies in the core. The dark-matter densities are marked in blue, and the dotted circle marks the dark-matter core. The map is superimposed onto visible-light images of the cluster. In the bottom image a second team, led by James Jee, used the Wide Field Planetary Camera 2 to find an unusual overabundance of dark matter in the cluster’s core, denoted by the bright blue color at image center. The observation was surprising because astronomers expect that dark matter and galaxies should be anchored together, even during a collision between galaxy clusters. Abell 520 is located 2.4 billion light-years away. Astronomers using the Atacama Large Millimeter/submillimeter Array (ALMA) have for the first time found that the outer region of a dusty disc encircling a brown dwarf contains millimetre-sized solid grains like those found in denser discs around newborn stars. The surprising finding challenges theories of how rocky, Earth-scale planets form, and suggests that rocky planets may be even more common in the Universe than expected. Rocky planets are thought to form through the random collision and sticking together of what are initially microscopic particles in the disc of material around a star. These tiny grains, known as cosmic dust, are similar to very fine soot or sand. However, in the outer regions around a brown dwarf — a star-like object, but one too small to shine brightly like a star — astronomers expected that grains could not grow because the discs were too sparse, and particles would be moving too fast to stick together after colliding. Also, prevailing theories say that any grains that manage to form should move quickly towards the central brown dwarf, disappearing from the outer parts of the disc where they could be detected. This artist’s impression shows these grains of cosmic dust in the disc around the brown dwarf. This video starts with a broad panorama of the spectacular central regions of the Milky Way seen in visible light. It zooms in to the Rho Ophiuchi star-forming region, to the brown dwarf ISO-Oph 102, or Rho-Oph 102. Then, an artist’s impression shows the disc of material around the brown dwarf, and zooms in to show how tiny grains collide and stick together, to form large grains. “We were completely surprised to find millimetre-sized grains in this thin little disc,” said Luca Ricci of the California Institute of Technology, USA, who led a team of astronomers based in the United States, Europe and Chile. “Solid grains of that size shouldn’t be able to form in the cold outer regions of a disc around a brown dwarf, but it appears that they do. We can’t be sure if a whole rocky planet could develop there, or already has, but we’re seeing the first steps, so we’re going to have to change our assumptions about conditions required for solids to grow,” he said. ALMA’s increased resolution compared to previous telescopes also allowed the team to pinpoint carbon monoxide gas around the brown dwarf — the first time that cold molecular gas has been detected in such a disc. This discovery, and that of the millimetre-size grains, suggest that the disc is much more similar to the ones around young stars than previously expected. This image shows the brown dwarf ISO-Oph 102, or Rho-Oph 102, in the Rho Ophiuchi star-forming region. Its position is marked by the crosshairs. This visible-light view was created from images forming part of the Digitized Sky Survey 2. Ricci and his colleagues made their finding using the partially completed ALMA telescope in the high-altitude Chilean desert. ALMA is a growing collection of high precision, dish-shaped antennas that work together as one large telescope to observe the Universe with groundbreaking detail and sensitivity. ALMA “sees” the Universe in millimetre-wavelength light, which is invisible to human eyes. Construction of ALMA is scheduled to finish in 2013, but astronomers began observing with a partial array of ALMA dishes in 2011. The astronomers pointed ALMA at the young brown dwarf ISO-Oph 102, also known as Rho-Oph 102, in the Rho Ophiuchi star-forming region in the constellation of Ophiuchus (The Serpent Bearer). With about 60 times the mass of Jupiter but only 0.06 times that of the Sun, the brown dwarf has too little mass to ignite the thermonuclear reactions by which ordinary stars shine. However, it emits heat released by its slow gravitational contraction and shines with a reddish colour, albeit much less brightly than a star. This artist’s impression first shows the disc of material around a brown dwarf, and then zooms in to show how tiny grains collide and stick together, to form large grains. ALMA collected light with wavelengths around a millimetre, emitted by disc material warmed by the brown dwarf. The grains in the disc do not emit much radiation at wavelengths longer than their own size, so a characteristic drop-off in the brightness can be measured at longer wavelengths. ALMA is an ideal instrument for measuring this drop-off and thus for sizing up the grains. The astronomers compared the brightness of the disc at wavelengths of 0.89 mm and 3.2 mm. The drop-off in brightness from 0.89 mm to 3.2 mm was not as steep as expected, showing that at least some of the grains are a millimetre or more in size. “ALMA is a powerful new tool for solving mysteries of planetary system formation,” commented Leonardo Testi from ESO, a member of the research team. “Trying this with previous generation telescopes would have needed almost a month of observing — impossibly long in practice. But, using just a quarter of ALMA's final complement of antennas, we were able to do it in less than one hour!” he said. This research is presented in a paper in the Astrophysical Journal Letters. Ricci and Testi worked with Antonella Natta of the INAF-Osservatorio Astrofisico de Arcetri, Aleks Scholz of the Dublin Institute for Advanced Studies, and Itziar de Gregorio-Monsalvo of the Joint ALMA Observatory. This video starts with a broad panorama of the spectacular central regions of the Milky Way seen in visible light. It then zooms in to the Rho Ophiuchi star-forming region, to the brown dwarf ISO-Oph 102, or Rho-Oph 102. Virginia Tech physicists have discovered a quasar with the most energetic outflow ever seen, a finding that may answer questions about how the mass of a galaxy is linked to its central black hole mass and why there are so few large galaxies in the universe. Researchers studied the quasar known as SDSS J1106+1939 in great detail using the European Southern Observatory’s Very Large Telescope in Paranal, Chile – the world’s most advanced visible-light astronomical observatory, and found the most energetic quasar outflow ever discovered. The rate that energy is carried away by the huge mass of material ejected is equivalent to two trillion times the power output of the sun. “This is about 100 times higher than the total power output of the Milky Way galaxy — it’s a real monster outflow,” said Nahum Arav, an associate professor of physics in College of Science and leader of the research team, which includes Benoit Borguet, now a postdoctoral researcher now at the University of Liege, Belgium; Doug Edmonds and Carter Chamberlain, both graduate research assistants at Virginia Tech; and Chris Benn, a collaborator who works with the Isaac Newton Group of Telescopes in Spain. The findings were released today (Wednesday, Nov. 28, 2012) by the European Southern Observatory. Theorists have predicted energy flows of this magnitude, and simulations have suggested these outflows impact the galaxies around them, but it has all been speculation — until now. Quasars are light phenomenon produced as material falls into a black hole producing a huge amount of energy. The bigger the black hole, the bigger the quasar. The Milky Way, according to Arav, is a big galaxy with a "smallish" black hole. The black hole at the heart of quasar SDSS J1106-1939 is massive, estimated to be a thousand times heavier than the black hole in the Milky Way. And while black holes are noted for pulling material in, quasars accelerate some of the material and eject it at high speed. The larger the quasar, the more material it can take, the higher speed it can accelerate it, and the further it can eject the material. The quasar’s outflow is at least five times more powerful than the previous record holder, also discovered by Arav and his research group in 2009, and material from the outflow is inferred to be about a thousand light years away from the black hole at the heart of quasar SDSS J1106-1939. Every year, according to the team’s analysis, a mass of more than 400 times that of the sun is streaming away from the quasar at a speed of 8,000 kilometers per second. The European Southern Observatory contributed information to this report. A new paradigm for understanding the earliest eras in the history of the universe has been developed by scientists at Penn State University. Using techniques from an area of modern physics called loop quantum cosmology, developed at Penn State, the scientists now have extended analyses that include quantum physics farther back in time than ever before -- all the way to the beginning. The new paradigm of loop quantum origins shows, for the first time, that the large-scale structures we now see in the universe evolved from fundamental fluctuations in the essential quantum nature of "space-time," which existed even at the very beginning of the universe over 14 billion years ago. The achievement also provides new opportunities for testing competing theories of modern cosmology against breakthrough observations expected from next-generation telescopes. The research will be published on 11 December 2012 as an "Editor's Suggestion" paper in the scientific journal Physical Review Letters. This image is a plot of the power spectra in the cosmic microwave background (CMB) predicted in Loop Quantum Cosmology and in the Standard Inflationary Scenario. The two different spectra are contrasted in this plot, which shows their ratio as a function of k, the inverse of wave length, of fluctuations in the cosmic microwave background. For many of the parameters, observable wave numbers k are greater than 9 and the two predictions are indistinguishable. For a narrow window of parameters, observable k can be smaller than 9. Then the two predictions differ. Both are in agreement with currently available data, but future observations should be able to distinguish between them. We humans always have yearned to understand more about the origin and evolution of our universe," said Abhay Ashtekar, the senior author of the paper. "So it is an exciting time in our group right now, as we begin using our new paradigm to understand, in more detail, the dynamics that matter and geometry experienced during the earliest eras of the universe, including at the very beginning." Ashtekar is the Holder of the Eberly Family Chair in Physics at Penn State and the director of the university's Institute for Gravitation and the Cosmos. Coauthors of the paper, along with Ashtekar, are postdoctoral fellows Ivan Agullo and William Nelson. The new paradigm provides a conceptual and mathematical framework for describing the exotic "quantum-mechanical geometry of space-time" in the very early universe. The paradigm shows that, during this early era, the universe was compressed to such unimaginable densities that its behavior was ruled not by the classical physics of Einstein's general theory of relativity, but by an even more fundamental theory that also incorporates the strange dynamics of quantum mechanics. The density of matter was huge then -- 1094 grams per cubic centimeter, as compared with the density of an atomic nucleus today, which is only 1014 grams. In this bizarre quantum-mechanical environment -- where one can speak only of probabilities of events rather than certainties -- physical properties naturally would be vastly different from the way we experience them today. Among these differences, Ashtekar said, are the concept of "time," as well as the changing dynamics of various systems over time as they experience the fabric of quantum geometry itself. "What is unique about this effort is that it brought together the key scientists and all of the different methods to estimate ice loss," said Tom Wagner, NASA's cryosphere program manager in Washington. "It's a major challenge they undertook, involving cutting-edge, difficult research to produce the most rigorous and detailed estimates of ice loss from Greenland and Antarctica to date. The results of this study will be invaluable in informing the IPCC as it completes the writing of its Fifth Assessment Report over the next year." Professor Andrew Shepherd of the University of Leeds in the United Kingdom coordinated the study, along with research scientist Erik Ivins of NASA's Jet Propulsion Laboratory in Pasadena, Calif. Shepherd said the venture's success is because of the cooperation of the international scientific community and the precision of various satellite sensors from multiple space agencies. "Without these efforts, we would not be in a position to tell people with confidence how Earth's ice sheets have changed, and to end the uncertainty that has existed for many years," Shepherd said. The study found variations in the pace of ice sheet change in Antarctica and Greenland. "Both ice sheets appear to be losing more ice now than 20 years ago, but the pace of ice loss from Greenland is extraordinary, with nearly a five-fold increase since the mid-1990s," Ivins said. "In contrast, the overall loss of ice in Antarctica has remained fairly constant with the data suggesting a 50-percent increase in Antarctic ice loss during the last decade." A NASA spacecraft studying Mercury has provided compelling support for the long-held hypothesis the planet harbors abundant water ice and other frozen volatile materials within its permanently shadowed polar craters. The new information comes from NASA's MErcury Surface, Space ENvironment, GEochemistry, and Ranging (MESSENGER) spacecraft. Its onboard instruments have been studying Mercury in unprecedented detail since its historic arrival there in March 2011. Scientists are seeing clearly for the first time a chapter in the story of how the inner planets, including Earth, acquired their water and some of the chemical building blocks for life. A radar image of Mercury's north polar region acquired by the Arecibo Observatory. Yellow areas denote regions of high radar reflectivity. Since their discovery in 1992, these polar deposits have been hypothesized to consist of water ice trapped in permanently shadowed areas near Mercury’s north and south pole, but other explanations for the polar deposits have also been suggested. Polar stereographic projection. From J. K. Harmon et al., Icarus, 211, 37–50 (2011). "The new data indicate the water ice in Mercury's polar regions, if spread over an area the size of Washington, D.C., would be more than 2 miles thick," said David Lawrence, a MESSENGER participating scientist at the Johns Hopkins University Applied Physics Laboratory (APL) in Laurel, Md., and lead author of one of three papers describing the findings. The papers were published online in Thursday's edition of Science Express. Spacecraft instruments completed the first measurements of excess hydrogen at Mercury's north pole, made the first measurements of the reflectivity of Mercury's polar deposits at near-infrared wavelengths, and enabled the first detailed models of the surface and near-surface temperatures of Mercury's north polar regions. Given its proximity to the sun, Mercury would seem to be an unlikely place to find ice. However, the tilt of Mercury's rotational axis is less than 1 degree, and as a result, there are pockets at the planet's poles that never see sunlight. Tradar image of Mercury's north polar region from Image 2.1 is shown superposed on a mosaic of MESSENGER images of the same area. All of the larger polar deposits are located on the floors or walls of impact craters. Deposits farther from the pole are seen to be concentrated on the north-facing sides of craters. Updated from N. L. Chabot et al., Journal of Geophysical Research, 117, doi: 10.1029/2012JE004172 (2012). Scientists suggested decades ago there might be water ice and other frozen volatiles trapped at Mercury's poles. The idea received a boost in 1991 when the Arecibo radio telescope in Puerto Rico detected radar-bright patches at Mercury's poles. Many of these patches corresponded to the locations of large impact craters mapped by NASA's Mariner 10 spacecraft in the 1970s. However, because Mariner saw less than 50 percent of the planet, planetary scientists lacked a complete diagram of the poles to compare with the radar images. Images from the spacecraft taken in 2011 and earlier this year confirmed all radar-bright features at Mercury's north and south poles lie within shadowed regions on the planet's surface. These findings are consistent with the water ice hypothesis. The new observations from MESSENGER support the idea that ice is the major constituent of Mercury's north polar deposits. These measurements also reveal ice is exposed at the surface in the coldest of those deposits, but buried beneath unusually dark material across most of the deposits. In the areas where ice is buried, temperatures at the surface are slightly too warm for ice to be stable. MESSENGER's neutron spectrometer provides a measure of average hydrogen concentrations within Mercury's radar-bright regions. Water ice concentrations are derived from the hydrogen measurements. "We estimate from our neutron measurements the water ice lies beneath a layer that has much less hydrogen. The surface layer is between 10 and 20 centimeters [4-8 inches] thick," Lawrence said. Additional data from detailed topography maps compiled by the spacecraft corroborate the radar results and neutron measurements of Mercury's polar region. In a second paper by Gregory Neumann of NASA's Goddard Flight Center in Greenbelt, Md., measurements of the shadowed north polar regions reveal irregular dark and bright deposits at near-infrared wavelength near Mercury's north pole. "Nobody had seen these dark regions on Mercury before, so they were mysterious at first," Neumann said. The spacecraft recorded dark patches with diminished reflectance, consistent with the theory that ice in those areas is covered by a thermally insulating layer. Neumann suggests impacts of comets or volatile-rich asteroids could have provided both the dark and bright deposits, a finding corroborated in a third paper led by David Paige of the University of California at Los Angeles. Shown in red are areas of Mercury’s north polar region that are in shadow in all images acquired by MESSENGER to date. Image coverage, and mapping of shadows, is incomplete near the pole. The polar deposits imaged by Earth-based radar are in yellow (from Image 2.1), and the background image is the mosaic of MESSENGER images from Image 2.2. This comparison indicates that all of the polar deposits imaged by Earth-based radar are located in areas of persistent shadow as documented by MESSENGER images. Updated from N. L. Chabot et al., Journal of Geophysical Research, 117, doi: 10.1029/2012JE004172 (2012). "The dark material is likely a mix of complex organic compounds delivered to Mercury by the impacts of comets and volatile-rich asteroids, the same objects that likely delivered water to the innermost planet," Paige said. This dark insulating material is a new wrinkle to the story, according to MESSENGER principal investigator Sean Solomon of Columbia University's Lamont-Doherty Earth Observatory in Palisades, N.Y.
"For more than 20 years, the jury has been deliberating whether the planet closest to the sun hosts abundant water ice in its permanently shadowed polar regions," Solomon said. "MESSENGER now has supplied a unanimous affirmative verdict." MESSENGER was designed and built by APL. The lab manages and operates the mission for NASA's Science Mission Directorate in Washington. The mission is part of NASA's Discovery Program, managed for the directorate by the agency's Marshall Space Flight Center in Huntsville, Ala. In a ribbon-cutting ceremony on September 12, 2012, the National Institute of Standards and Technology (NIST) unveiled a new laboratory designed to demonstrate that a typical-looking suburban home for a family of four can generate as much energy as it uses in a year. Following an initial year-long experiment, the facility will be used to improve test methods for energy-efficient technologies and develop cost-effective design standards for energy-efficient homes that could reduce overall energy consumption and harmful pollution, and save families money on their monthly utility bills. The unique facility looks and behaves like an actual house, and has been built to U.S. Green Building Council LEED Platinum standards—the highest standard for sustainable structures. The two-story, four-bedroom, three-bath Net-Zero Energy Residential Test Facility incorporates energy-efficient construction and appliances, as well as energy-generating technologies such as solar water heating and solar photovoltaic systems. Funded by the American Recovery and Reinvestment Act of 2009, which included green technologies among its priorities, the facility was built almost entirely with U.S.-made materials and equipment. Through its Building America effort, the Department of Energy (DOE) provided architectural design, training and management support for this project. Deputy Assistant Secretary for Energy Efficiency Kathleen Hogan represented DOE during the ribbon-cutting. For the first year of its operation, the lab will be used to demonstrate net-zero energy usage. NIST researchers will use computer software and mechanical controls to simulate the activities of a family of four living in an energy-efficient home. No actual humans will be allowed to enter the house during this time so that researchers can monitor how the house performs, but lights will turn on and off at specified times, hot water and appliances will run—and small devices will emit heat and humidity just as people would. A solar photovoltaic system will generate electricity to power lights and appliances when weather permits, and excess energy will be sent back to the local utility grid by means of a smart electric meter. The house will draw energy from the grid on days it cannot generate enough on its own, but over the course of a year it will produce enough to make up for that purchased energy, for a net-zero energy usage. During the ceremony, Rick Fedrizzi, president, CEO and founding chairman of the U.S. Green Building Council, announced that the Net-Zero Energy Residential Test Facility has earned a LEED Platinum rating. NIST researchers plan to make data from the net-zero experiment available online so that researchers and the public can follow its progress. Visit http://www.nist.gov/el/nzertf/ for images, video and more details on the new laboratory. The camera was tested at the Kjell Henriksen Observatory (KHO) in Svalbard, Norway, where it produced the first-ever hyperspectral images of auroras—commonly referred to as "the Northern (or Southern) Lights"—and may already have revealed a previously unknown atmospheric phenomenon. Details on the camera and the results from its first images were published today in the Optical Society's (OSA) open-access journal Optics Express. Auroras, nature's celestial fireworks, are created when charged particles from the Sun penetrate Earth's magnetic field. These shimmering displays in the night sky reveal important information about the Earth-Sun system and the way our planet responds to powerful solar storms. Current-generation cameras, however, are simply light buckets—meaning they collect all the light together into one image—and lack the ability to separately capture and analyze multiple slivers of the visible spectrum. That means if researchers want to study auroras by looking at specific bands or a small portion of the spectrum they would have to use a series of filters to block out the unwanted wavelengths. "A standard filter wheel camera that typically uses six interference filters will not be able to spin the wheel fast enough compared to the NORUSCA II camera," said Fred Sigernes of the University Centre in Svalbard (UNIS), Norway. "This makes the new hyperspectral capability particularly useful for spectroscopy, because it can detect specific atmospheric constituents by their unique fingerprint, or wavelengths, in the light they emit." These spectral signatures can then reveal subtle changes in atmospheric behavior, such as the ionization of gases during auroras. This form of multispectral imaging also will enable scientists to better classify auroras from background sky emissions and study the way they cluster in the atmosphere. On Jan. 24, 2012, during the inaugural research campaign of NORUSCA II, a major solar flare jettisoned a burst of high-energy particles known as a Coronal Mass Ejection (CME). The CME eventually slammed into Earth's magnetic field, producing magnificent auroras and a chance to fully test the new camera. The researchers were able to image the aurora in unprecedented clarity through a layer of low altitude clouds, which would have thwarted earlier-generation instruments (see Image 1). The camera also revealed something unexpected—a very faint wave pattern of unknown origin in the lower atmosphere (see Image 2). The wave pattern resembles "airglow"—the natural emission of light by Earth's atmosphere. Airglow can be produced by a variety of known sources, including cosmic rays striking the upper atmosphere and chemical reactions. Its concurrent appearance with the aurora suggests that it may also be caused by a previously unrecognized source. "After the January CME, we think we saw an auroral-generated wave interaction with airglow," said Sigernes. This would be an entirely new phenomenon and if confirmed, would be the first time airglow has been associated with auroras. "Our new all-sky camera opens up new frontiers of discovery and will help in the detection of auroras and the understanding of how our Sun impacts the atmosphere here on Earth. Additional development and commissioning will also hopefully verify our intriguing first results," concludes Sigernes. Paper: "Hyper-Spectral All-Sky Imaging of Auroras," Optics Express, Vol. 20, Issue 25, pp. 27650-27660 (2012). Oceanic crust covers two-thirds of the Earth’s solid surface, but scientists still don’t entirely understand the process by which it is made. Analysis of more than 600 samples of oceanic crust by a team including Carnegie’s Frances Jenner reveals a systemic pattern that alters long-held beliefs about how this process works, explaining a crucial step in understanding Earth’s geological deep processes. Their work is published in Nature on November 29.
Credit: courtesy of the U.S. Forest Service. Magmas generated by melting of the Earth’s mantle rise up below the oceanic crust and erupt on the Earth’s surface at mid-ocean ridge systems, the longest mountain ranges in the world. When the magma cools it forms basalt, the planet’s most-common rock and the basis for oceanic crust. It has long been assumed that the composition of magmas erupting out of mid-ocean ridges is altered when minerals that form during cooling sink out of the remaining liquid, a process called fractional crystallization. In theory, trace elements that are not included in the crystallizing minerals should be little affected by this process, and their ratios should be the same in the erupting magma as they were in the original magma before cooling. If this is true, trace element ratios in magmas erupting at mid-ocean ridges should represent those of the original parental magma that formed deep in the Earth’s mantle. However, this process doesn’t account for the high abundance of trace elements found in samples of basalt from mid-ocean ridges around the world, so the reality of the situation is obviously more complicated than previous theories indicated. Using the extensive array of samples and advanced modeling, Jenner and her research partner Hugh O’Neill of the Australian National University demonstrated that the concentration of trace elements is due to the process by which the magma is cycled through the oceanic crust prior to being erupted on the sea floor at the mid-ocean ridges. Magma collects under the Earth’s surface in a pool of liquid rock called a magma chamber. Each chamber is frequently flushed with new magma, which mixes with the old magma that was already there, and then this blended magma erupts out onto the ocean floor. Following the influx of new magma and eruption, the remaining magma undergoes fractional crystallization. This means that minerals are separated out from the magma as it cools. However, these minerals contain only minor amounts of the trace elements. As a result, trace elements build up in the magma over time, as the magma chamber is continually replenished by new magma coming in to the system. This work was funded by the Australian National University. Having the ability to predict – let alone trying to control – the dynamics of complex networks remains a central challenge throughout network science. Structural and dynamical similarities among different real networks suggest that some universal laws might be in action, although the nature and common origin of such laws remain elusive. Simple mapping between the two surfaces representing the geometries of the universe and complex networks proves that their large-scale growth dynamics and structures are similar. Of course the network representing the structure of the universe is astronomically huge – in fact it can be infinite. But even if it is finite, researchers’ best guess is that it is no smaller than 10250atoms of space and time. (That’s the digit 1 followed by 250 zeros.) For comparison, the number of water molecules in all the oceans in the world has been estimated to be 4.4 x 1046. Yet the researchers found a way to downscale this humongous network while preserving its vital properties, by proving mathematically that these properties do not depend on the network size in a certain range of parameters, such as the curvature and age of our universe. After the downscaling, the research team turned to Trestles, one of SDSC’s data-intensive supercomputers, to perform simulations of the universe’s growing causal network. By parallelizing and optimizing the application, Robert Sinkovits, a computational scientist with SDSC, was able to complete in just over one day a computation that was originally projected to require three to four years. “In addition to being able to complete these simulations much faster than previously ever imagined, the results perfectly matched the theoretical predictions of the researchers,” said Sinkovits. “Such an explanation could one day lead to a discovery of common fundamental laws whose two different consequences or limiting regimes are the laws of gravity (Einstein's equations in general relativity) describing the dynamics of the universe, and some yet-unknown equations describing the dynamics of complex networks,” added Marián Boguñá, a member of the research team from the Departament de Física Fonamental at the Universitat de Barcelona, Spain. The other researchers who worked on this project are Maksim Kitsak, CAIDA/SDSC/UC San Diego; and David Rideout and David Meyer, Department of Mathematics at UC San Diego. This research was supported by multiple grants, including Defense Advanced Research Projects Agency (DARPA) grant number HR0011-12-1-0012; NSF grants number CNS-0964236 and CNS-1039646; Cisco Systems; Foundational Questions Institute grant number FQXi-RFP3-1018; George W. and Carol A. Lattimer Campus Professorship at UC San Diego; Office of the Ministry of Economy and Competitiveness, Spain (MICINN) project number FIS2010-21781-C02-02; Generalitat de Catalunya grant number 2009SGR838; and by the Catalan Institution for Research and Advanced Studies (ICREA) Academia Prize funded by the Generalitat de Catalunya, Spain. NASA's Cassini spacecraft has been traveling the Saturnian system in a set of inclined, or tilted, orbits that give mission scientists a vertigo-inducing view of Saturn's polar regions. This perspective has yielded images of roiling storm clouds and a swirling vortex at the center of Saturn's famed north polar hexagon. First seen in 2008, these images from NASA's Cassini spacecraft reveal a giant cyclone at Saturn's north pole, and show that a similarly monstrous cyclone churning at Saturn's south pole is powered by Earth-like storm patterns and is still raging four years later. In 2008, the cyclone at Saturn's north pole was only visible in the near-infrared wavelengths because the north pole is in winter, thus in darkness to visible-light cameras. At these wavelengths, about seven times greater than light seen by the human eye, the clouds deep inside Saturn's atmosphere are seen in silhouette against the background glow of Saturn's internal heat. "These are truly massive cyclones, hundreds of times stronger than the most giant hurricanes on Earth," said Kevin Baines, Cassini scientist in 2008 on the visual and infrared mapping spectrometer at NASA's Jet Propulsion Laboratory, Pasadena, Calif. "Dozens of puffy, convectively formed cumulus clouds swirl around both poles, betraying the presence of giant thunderstorms lurking beneath. Thunderstorms are the likely engine for these giant weather systems," said Baines. The camera was pointing toward Saturn from approximately 233,742 miles (376,171 kilometers) away. The camera was pointing toward Saturn from approximately 248,578 miles (400,048 kilometers) away. These phenomena mimic what Cassini found at Saturn's south pole a number of years ago. Cassini has also seen storms circling Saturn's north pole in the past, but only in infrared wavelengths because the north pole was in darkness. (See http://www.jpl.nasa.gov/news/news.php?release=2008-192 .) But, with the change of the Saturnian seasons, the sun has begun to creep over the planet's north pole. This near-infrared movie of Saturn’s north pole shows a giant cyclone, encircled by a hexagon feature. The movie was created from several images, taken by the visual and infrared mapping spectrometer onboard the Cassini spacecraft. The hexagon itself is populated by fast-moving clouds which reach speeds of over 530 kilometers per hour (300 miles per hour). The discrete, circular and oblong clouds dotting the image are likely convective upwelling originating deep inside the planet, which help power the cyclones. The movie shows clouds throughout the atmosphere, down to as deep as 125 kilometers (78 miles) below the haze. Many of the features seen are thought to be deep-level clouds of ammonia-hydrosulfide, which rise to higher altitudes in convective updrafts. This particular set of raw, unprocessed images was taken on Nov. 27, 2012, from a distance of about 250,000 miles (400,000 kilometers) from Saturn. More raw images are available at http://saturn.jpl.nasa.gov/photos/raw/index.cfm. The Cassini-Huygens mission is a cooperative project of NASA, the European Space Agency and the Italian Space Agency. JPL, a division of the California Institute of Technology in Pasadena, manages the Cassini-Huygens mission for NASA's Science Mission Directorate, Washington. The Cassini orbiter and its two onboard cameras were designed, developed and assembled at JPL. The imaging team is based at the Space Science Institute in Boulder, Colo. Biologists at UC San Diego have demonstrated for the first time that marine algae can be just as capable as fresh water algae in producing biofuels. The scientists genetically engineered marine algae to produce five different kinds of industrially important enzymes and say the same process they used could be employed to enhance the yield of petroleum-like compounds from these salt water algae. Their achievement is detailed in a paper published online in the current issue of the scientific journal Algal Research. Salt ponds in the SF Bay area where the marine algae Dunaliella salina display a bright red color in response to the stress of high salt concentrations. The ability to genetically transform marine algae into a biofuel crop is important because it expands the kinds of environments in which algae can be conceivably grown for biofuels. Corn, for example, which is used to produce ethanol biofuel, requires prime farmland and lots of fresh water. But the UC San Diego study suggests that algal biofuels can be produced in the ocean or in the brackish water of tidelands or even on agricultural land on which crops can no longer be grown because of high salt content in the soil. That debate came to a head last month when a National Academy of Sciences committee examining the future potential of algal biofuels for the U.S. Department of Energy published a report pointing out that the production of algal biofuels might be limited by fresh water because no published research study had demonstrated the feasibility of using engineered marine species of algae. The UC San Diego biologists focused their study on a marine species of alga, Dunaliella tertiolecta, which had been earlier targeted by scientists for potential biofuels production because of its high oil content and ability to grow rapidly under a wide range of salinity and acidic conditions. To demonstrate that it could be used in commercial biofuel production, they introduced five genes into the alga that produced five different kinds of enzymes that could be used in an industrial setting to not only convert biomass to fuel, but also increase nutrient availability in animal feed. Some of these enzymes, for example, came from a fungus that degrades plant material into simple sugars. The UC San Diego biologists—who included D. Ryan Georgianna, Michael Hannon, Marina Marcuschi, Alex Lewis, James Hyun—collaborated on their project with three scientists from Sapphire Energy, Inc., a San Diego algal biotechnology company—Shuiqin Wu, Kyle Botsch and Michael Mendez. Their research effort was funded by the Air Force Office of Scientific Research and the State of California Energy Commission. A cornerstone of physics may require a rethink if findings at the National Institute of Standards and Technology (NIST) are confirmed. Recent experiments suggest* that the most rigorous predictions based on the fundamental theory of electromagnetism—one of the four fundamental forces in the universe, and harnessed in all electronic devices—may not accurately account for the behavior of atoms in exotic, highly charged states. The theory in question is known as quantum electrodynamics, or QED, which physicists have held in high regard for decades because of its excellent track record describing electromagnetism's effects on matter. In particular, QED has been especially useful in explaining the behavior of electrons, which orbit every atomic nucleus. But for all of QED's successes, there are reasons to believe that QED may not provide a complete picture of reality, so scientists have looked for opportunities to test it to ever-increasing precision. Observations made with NIST's Electron Beam Ion Trap indicate that in ions with a strongly positive charge, electrons can behave in ways inconsistent with quantum electrodynamics (QED) theory, which describes electromagnetism. While more experiments are needed, the data could imply that some aspects of QED theory require revision. One way to test parts of QED is to take a fairly heavy atom—titanium or iron, for example—and strip away most of the electrons that circle its nucleus. "If 20 of titanium's 22 electrons are removed, it becomes a highly charged ion that looks in many ways like a helium atom that has been shrunk to a tenth its original size," says NIST physicist John Gillaspy, a member of the research team. "Ironically, in this unusual state, the effects of QED are magnified, so we can explore them in more detail." Among the many things QED is good for is predicting what will happen when an electron orbiting the nucleus collides with a passing particle. The excited electron gets bumped up momentarily to a higher energy state but quickly falls back to its original orbit. In the process, it gives off a photon of light, and QED tells what color (wavelength) that photon will have. The NIST team found that electrons in highly charged helium-like ions that are excited in this fashion give off photons that are noticeably different in color than QED predicts. While the results—obtained using NIST's Electron Beam Ion Trap Facility—are interesting enough on their own to warrant publication, Gillaspy says he hopes the finding will stimulate others to measure the emitted photons with even greater accuracy. Currently, the NIST team is preparing to release the results of measurements of other colors of light emitted from the exotic atoms that bolster the initial findings. "What the NIST experiment found is interesting enough that it merits attention," says Jonathan Sapirstein, a professor of physics at the University of Notre Dame. "Independent calculations should be done to confirm the theory, and other experiments should also confirm the findings. However, if no errors are found in the theory and the NIST experiment is correct, some physics outside of QED must be present." A group headed by Remco van den Bosch from the Max Planck Institute for Astronomy has discovered a black hole that shakes the foundations of current models of galaxy evolution. This monster has 17 billion solar masses and is thus significantly heavier than the models predict. And even more significantly: the object could be the most massive black hole known to date. Invisible gravitational trap: the centre of the NGC 1277 disk galaxy harbours a black hole with 17 billion solar masses - one of the heaviest ever found. Astronomers believe there is a super-massive black hole at the heart of every galaxy. Its mass ranges from several hundred thousand solar masses to a few billion. The black hole that has been best investigated has around four million solar masses and sits at the centre of our home galaxy, the Milky Way. Studies of the masses of distant galaxies and their black holes have turned up an interesting relationship: accordingly, a black hole typically reaches only a tiny fraction - around 0.1 percent - of the total mass of all stars belonging to the parent galaxy. Although this relationship is not completely understood, it plays an important role in all current galaxy evolution models. Collection of galaxies: the Perseus cluster is around 250 million light years away from Earth. The NGC 1277 member galaxy (arrow) appears comparatively compact. Now, during a systematic search which started in 2010, the team headed by Remco van den Bosch has tracked down a black hole that could upset this generally accepted relationship. To accomplish this, the astronomers used the Hobby-Eberly telescope and archived images from the Hubble space telescope. The Hobby-Eberly telescope at the McDonald observatory in Texas/USA has a main mirror measuring 11 by 9.8 metres in total and is comprised of 91 hexagonal sub-mirrors. Thanks to the size of the optics, the observation of each individual galaxy can be carried out relatively quickly; the team was able to obtain almost 700 galactic spectra. The spectra enabled the astronomers to draw conclusions about the motions of the stars, which depend directly on the gravitation of the black hole. With the aid of specific changes, such as the shift of spectral lines (Doppler effect), they were able to derive the velocity, for example. The rule here: the more massive the black hole, the more rapid the motion of the stars in the centre of the galaxy. The team thus identified six candidate galaxies which were comparatively small and had to have large black holes. The archives of the Hubble space telescope already contained detailed images of one of them, NGC 1277. In order to determine the mass of the black hole, van den Bosch and his colleagues produced a dynamic model of the galaxy that includes all possible stellar orbits. Systematic comparisons of model and observation data then showed which orbits in combination with which mass value for the black hole provided the best explanation for the observations. In the case of the NGC 1277 disk galaxy, the astronomers arrived at around 17 billion solar masses. This meant that the black hole could be the largest known object of this class. Researchers estimate the mass of the current record holder to be between 6 and 37 billion solar masses; if the true value is at the lower end, NGC 1277 breaks this record. The greatest surprise for the astronomers was that the mass of the huge gravitational trap amounted to around 14 percent of NGC 1277’s total mass - which is significantly more that the 0.1 percent stated above and means a factor of more than ten. In other words: the astronomers had expected a black hole of this size in an unstructured (“elliptic”) galaxy at least ten times as big - but not in a small disk galaxy like NGC 1277. Is this a rare freak of nature, an exception? Preliminary analyses of further data point in a different direction: Remco van den Bosch and his colleagues have to date discovered five further galaxies which are comparatively small, but might nevertheless have unusually massive central black holes. This will only be known for sure when detailed images of these galactic systems are available, however. If these further cases are confirmed and there are indeed more black holes like the one found in NGC 1277, then astronomers will need to fundamentally rethink their galaxy evolution models. They will particularly have to direct their attention to the early universe: the NGC 1277 galaxy appears to have formed more than eight billion years ago and has not changed very much since then. No matter how this gigantic black hole formed - it must have happened a long time ago. Citation: Van den Bosch, R. C. E. et al. Nature, 29 November 2012: doi:10.1038/nature11592 (2012). A team of archaeologists from the University of Rhode Island, the Israel Antiquities Authority, and the University of Louisville have discovered the remains of a fleet of early-19th century ships and ancient harbor structures from the Hellenistic period (third to first century B.C.) at the city of Akko, one of the major ancient ports of the eastern Mediterranean. The findings shed light on a period of history that is little known and point to how and where additional remains may be found. The discoveries were presented on November 15 and 17 in Chicago at the annual meeting of the American Schools of Oriental Research by URI assistant professors Bridget Buxton and William Krieger on behalf of the Israel Coast Exploration project. According to Buxton, three of the four well-preserved shipwrecks found off the coast south of Akko were first detected using a sub-bottom profiler in 2011. Later, storms stripped off several meters of inshore sediments and temporarily revealed the wrecks, as well as an additional large vessel. The wrecks are now reburied. During the brief time the shipwrecks were exposed, the Israel Antiquities Authority investigated one of them: a 32 meter vessel which still preserved its brass gudgeon (rudder socket) and many small artifacts, such as plates, a candlestick, and even a cooking pot with bones in it. Laboratory analyses completed this summer by the IAA revealed that the ship's wood came from Turkey. The team believes these ships may have belonged to the Egyptian navy under Admiral Osman Nurredin Bey, whose ships were severely damaged in his attempt to capture Akko in the Egyptian-Ottoman War of 1831. The town eventually fell to Egyptian land forces under Ibrahim Pasha in 1832. "These ships have occasionally been exposed and buried again by storms since we found them," Buxton said. "We're in a race against time to find other ships in the area and learn from them before storms totally dislodge or destroy them." Although shipwrecks from the 1800s are not the highest priorities in a region where civilization goes back thousands of years, Buxton is excited by the discovery for what it tells her about where much older ships may be found. "Like many underwater archaeologists I'm very interested in finding a well-preserved example of an ancient multi-decked warship from the Hellenistic age," said Buxton. "These ships were incredible pieces of technology, but we don't know much about their design because no hulls have been found. However, a combination of unusual environmental and historical factors leads us to believe we have a chance of finding the remains of one of these ships off the northern coast of Israel." Buxton believes that the ships they are looking for are likely buried in the coastal sediment, which has built up over the centuries through natural processes. However, time is not on their side. "That protective silt is now being stripped away," she said. "And it's being stripped away a lot faster than it was originally dumped, by a combination of development, environmental changes, and the effects of the Aswan Dam." The Nile River has historically deposited large quantities of silt in the area, but the dam has significantly reduced the flow of silt. The archaeologists found the ships and another early modern vessel within Akko's modern harbor while testing their equipment in preparation for an ongoing survey out in deeper water. The sub-bottom profiler detects anomalies below the sea floor. "It's the gift that keeps on giving," Buxton said. "We found so many targets to explore that we didn't have time to check all of them, but even just having information about where things are helps Koby (Jacob Sharvit, director of the IAA Maritime Antiquities Unit) know where to look after any big storms." One line of buried targets detected off the southern seawall of old Akko is particularly suggestive. Continuing excavations in this area over the summer revealed an alignment between these targets and a newly-discovered slipway and shipshed structure, which continued out under the sea floor 25 meters from the Ottoman city wall. The feature resembles other naval shipsheds found in places such as Athens where they were used to haul up ancient warships. The excavation project was initially undertaken to strengthen the eroding sea wall, but it also revealed Hellenistic masonry, pottery vessels, an ancient mooring stone, and a stone quay 1.3 meters below the modern sea level. The possibility that much more of the Hellenistic port lies well-preserved under the sea floor is exciting for the archaeologists, because it means that shipwrecks from earlier centuries that have so far not been found at Akko may simply be buried deeper down in the sediment. "We've got fragmentary historic records for this area in the Hellenistic period, and now we've found a very important feature from the ancient harbor. Ancient shipwrecks are another piece of the puzzle that will help us to rewrite the story of this region at a critical time in Mediterranean history," she said. Located on the northern coast of Israel, the UNESCO World Heritage Site of Akko is one of the few cities in the Mediterranean with more than 5,000 years of maritime history. Also known as Acre, Ake and Ptolemais, its port was an important waypoint for the Phoenicians, Romans, Crusaders, Ottomans and other ancient maritime empires. In the Hellenistic period, it was bitterly fought over by the rival empires of Egypt and Syria. "Understanding the history and archaeology of Akko's port is crucial to understanding the broader issues of maritime connectivity and the great power struggles that defined the history of the Eastern Mediterranean during the Hellenistic Age," Buxton said. A jet of X-rays from a supermassive black hole 12.4 billion light years from Earth has been detected by NASA's Chandra X-ray Observatory. This is the most distant X-ray jet ever observed and gives astronomers a glimpse into the explosive activity associated with the growth of supermassive black holes in the early universe. The jet was produced by a quasar named GB 1428+4217, or GB 1428 for short. Giant black holes at the centers of galaxies can pull in matter at a rapid rate producing the quasar phenomenon. The energy released as particles fall toward the black hole generates intense radiation and powerful beams of high-energy particles that blast away from the black hole at nearly the speed of light. These particle beams can interact with magnetic fields or ambient photons to produce jets of radiation. This composite image shows GB 1428+4217, a quasar that contains the most distant X-ray jet ever observed. This view contains X-rays from Chandra (blue), radio data from the Very Large Array (purple), and optical data from Hubble (yellow). The jet, whose shape is very similar in the X-ray and radio data, was produced by a giant black hole, at the center of a galaxy, pulling in matter at a rapid rate. The energy released as particles fall toward the black hole generates intense radiation and powerful beams of high-energy particles that blast away from the black hole at nearly the speed of light. GB 1428+4217 is located about 12.4 billion light years from Earth, surpassing the distance of previously discovered X-ray jets. "We're excited about this result not just because it's a record holder, but because very few X-ray jets are known in the early universe," said Teddy Cheung of the National Academy of Sciences, resident at the Naval Research Laboratory in Washington DC, and lead author of the paper describing these results. As the electrons in the jet fly away from the quasar, they move through a sea of background photons left behind after the Big Bang. When a fast-moving electron collides with one of these so-called cosmic microwave background photons, it can boost the photon's energy into the X-ray band. "Since the brightness of the jet in X-rays depends, among other things, on how fast the electrons are moving away from the black hole, discoveries like the jet in GB 1428 tell us something about the environment around supermassive black holes and their host galaxies not that long after the Big Bang," said co-author Lukasz Stawarz from the Japan Aerospace Exploration Agency in Kanagawa, Japan. "We're lucky that the universe gives us this natural amplifier and lets us detect this object with relatively short exposures," said co-author Aneta Siemiginowska, of the Harvard-Smithsonian Center for Astrophysics in Cambridge, MA, "Otherwise we might miss important physical processes happening at very large distances from Earth and as far away as GB 1428." While there is another possible source of X-rays for the jet -- radiation from electrons spiraling around magnetic field lines in the jet -- the authors favor the idea that the cosmic background radiation is being boosted because the jet is so bright. Prior to the discovery of the jet in GB 1428, the most distant X-ray jet known was 12.2 billion light years away, and another is located at about 12 billion light years, both discovered by authors of the GB 1428 paper. A very similar shaped jet in GB 1428 was also detected in radio waves with the NSF's Very Large Array (VLA). Is Housework A Health Hazard? Is Facebook A Factor In Psychotic Symptoms?